This article is about the mountain. For other uses, see Mont Blanc (disambiguation). Mont Blanc (pronounced [mɔ̃ blɑ̃]; Italian: Monte Bianco [ˈmonte ˈbjaŋko]), meaning "White Mountain", is the highest mountain in the Alps and the highest in Europe west of Russia's Caucasus peaks. [note 2] It rises 4,808.7 m (15,777 ft) above sea level and is ranked 11th in the world in topographic prominence. The mountain stands in a range called the Graian Alps, between the regions of Aosta Valley, Italy, and Savoie and Haute-Savoie, France. 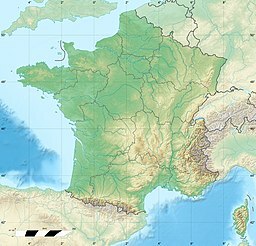 The location of the summit is on the watershed line between the valleys of Ferret and Veny in Italy and the valleys of Montjoie, and Arve in France, in the middle of what is generally considered to be the border between the two countries. The Mont Blanc massif is popular for outdoor activities like hiking, climbing, trail running and winter sports like skiing, and snowboarding. The three towns and their communes which surround Mont Blanc are Courmayeur in Aosta Valley, Italy; and Saint-Gervais-les-Bains and Chamonix in Haute-Savoie, France. The latter town was the site of the first Winter Olympics. A cable car ascends and crosses the mountain range from Courmayeur to Chamonix, through the Col du Géant. The 11.6 km (7 1⁄4-mile) Mont Blanc Tunnel, constructed between 1957 and 1965, runs beneath the mountain and is a major trans-Alpine transport route. The first recorded ascent of Mont Blanc (at the time neither within Italy nor France) was on 8 August 1786 by Jacques Balmat and the doctor Michel Paccard. This climb, initiated by Horace-Bénédict de Saussure, who gave a reward for the successful ascent, traditionally marks the start of modern mountaineering. The first woman to reach the summit was Marie Paradis in 1808. Nowadays the summit is ascended by an average of 20,000 mountaineer-tourists each year. It could be considered a technically easy, yet arduous, ascent for someone who is well-trained and acclimatized to the altitude. From l'Aiguille du Midi (where the cable car stops), Mont Blanc seems quite close, being 1,000 m (3,300 ft) higher. But while the peak seems deceptively close, La Voie des 3 Monts route (known to be more technical and challenging than other more commonly used routes) requires much ascent over two other 4,000 m mountains, Mont Blanc du Tacul and Mont Maudit, before the final section of the climb is reached and the last 1,000 m push to the summit is undertaken. Each year climbing deaths occur on Mont Blanc, and on the busiest weekends, normally around August, the local rescue service performs an average of 12 missions, mostly directed to aid people in trouble on one of the normal routes of the mountain. Some routes require knowledge of high-altitude mountaineering, a guide (or at least an experienced mountaineer), and all require proper equipment. All routes are long and arduous, involving delicate passages and the hazard of rock-fall or avalanche. Climbers may also suffer altitude sickness, occasionally life threatening, particularly if they do not acclimatize to it. 1832 Map of the Kingdom of Sardinia showing an administrative border passing through the summit of Mont Blanc. This was the same map annexed to the 1860 treaty to determine the current border between France and Italy. The border between Italy and France passes through the summit of Mont Blanc, making it both French and Italian. Since the French Revolution, the issue of the ownership of the summit has been debated. From 1416 to 1792, the entire mountain was within the Duchy of Savoy. In 1723, the Duke of Savoy, Victor Amadeus II, acquired the Kingdom of Sardinia. 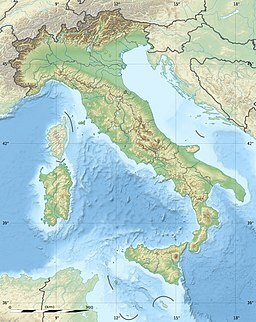 The resulting state of Sardinia was to become preeminent in the Italian unification. In September 1792, the French revolutionary Army of the Alps under Anne-Pierre de Montesquiou-Fézensac seized Savoy without much resistance and created a department of the Mont-Blanc. In a treaty of 15 May 1796, Victor Amadeus III of Sardinia was forced to cede Savoy and Nice to France. In article 4 of this treaty it says: "The border between the Sardinian kingdom and the departments of the French Republic will be established on a line determined by the most advanced points on the Piedmont side, of the summits, peaks of mountains and other locations subsequently mentioned, as well as the intermediary peaks, knowing: starting from the point where the borders of Faucigny, the Duchy of Aoust and the Valais, to the extremity of the glaciers or Monts-Maudits: first the peaks or plateaus of the Alps, to the rising edge of the Col-Mayor". This act further states that the border should be visible from the town of Chamonix and Courmayeur. However, neither is the peak of the Mont Blanc visible from Courmayeur nor is the peak of the Mont Blanc de Courmayeur visible from Chamonix because part of the mountains lower down obscure them. A Sardinian Atlas map of 1869 showing the summit lying two thirds in Italy and one third in France. After the Napoleonic Wars, the Congress of Vienna restored the King of Sardinia in Savoy, Nice and Piedmont, his traditional territories, overruling the 1796 Treaty of Paris. Forty-five years later, after the Second Italian War of Independence, it was replaced by a new legal act. This act was signed in Turin on 24 March 1860 by Napoleon III and Victor Emmanuel II of Savoy, and deals with the annexation of Savoy (following the French neutrality for the plebiscites held in Tuscany, Modena, Parma and Romagna to join the Kingdom of Sardinia, against the Pope's will). A demarcation agreement, signed on 7 March 1861, defined the new border. With the formation of Italy, for the first time Mont Blanc was located on the border of France and Italy. The 1860 act and attached maps are still legally valid for both the French and Italian governments. One of the prints from the 1823 Sarde Atlas positions the border exactly on the summit edge of the mountain (and measures it to be 4,804 m (15,761 ft) high). The convention of 7 March 1861 recognises this through an attached map, taking into consideration the limits of the massif, and drawing the border on the icecap of Mont Blanc, making it both French and Italian. Watershed analysis of modern topographic mapping not only places the main summit on the border, but also suggests that the border should follow a line northwards from the main summit towards Mont Maudit, leaving the southeast ridge to Mont Blanc de Courmayeur wholly within Italy. Although the Franco-Italian border was redefined in both 1947 and 1963, the commission made up of both Italians and French ignored the Mont Blanc issue. The area from the Torino Hut to the summit is under the control of the Italian authority.NATO uses Italian military maps to operate. In the early 21st century, administration of the mountain is shared between the Italian town of Courmayeur and the French town of Saint-Gervais-les-Bains, although the larger part of the mountain lies within the commune of the latter. The first professional scientific investigations on the summit were conducted by the botanist–meteorologist Joseph Vallot at the end of the 19th century. He wanted to stay near the top of the summit, so he built his own permanent cabin. In 1890, Pierre Janssen, an astronomer and the director of the Meudon astrophysical observatory, considered the construction of an observatory at the summit of Mont Blanc. Gustave Eiffel agreed to take on the project, provided he could build on a rock foundation, if found at a depth of less than 12 m (39 ft) below the ice. In 1891, the Swiss surveyor Imfeld dug two 23-metre-long (75 ft) horizontal tunnels 12 m below the ice summit but found nothing solid. Consequently, the Eiffel project was abandoned. Despite this, the observatory was built in 1893. During the cold wave of January 1893, a temperature of −43 °C (−45 °F) was recorded on Mont Blanc, being the lowest ever recorded there. Levers attached to the ice supported the observatory. This worked to some extent until 1906, when the building started leaning heavily. The movement of the levers corrected the lean slightly, but three years later (two years after Janssen's death), a crevasse started opening under the observatory. It was abandoned. Eventually the building fell, and only the tower could be saved in extremis. The mountain was the scene of two fatal air crashes; Air India Flight 245 in 1950 and Air India Flight 101 in 1966. Both planes were approaching Geneva Airport and the pilots miscalculated their descent; 48 and 117 people, respectively, died. The latter passengers included nuclear scientist Homi J. Bhabha, known as the "father" of India's nuclear programme. In 1946, a drilling project was initiated to carve a tunnel through the mountain. 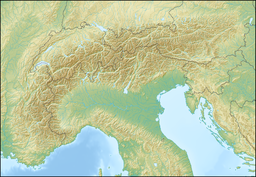 The Mont Blanc tunnel would connect Chamonix, France and Courmayeur, Italy, and become one of the major trans-Alpine transport routes between the two countries. In 1965, the tunnel opened to vehicle traffic with a length of 11,611 metres (7.215 mi). In 1999, a transport truck caught fire in the tunnel beneath the mountain. In total 39 people were killed when the fire raged out of control. The tunnel was renovated in the aftermath to increase driver safety, reopening after three years. The record for the youngest person to climb Mont Blanc was set in 2009 by 10-year-old Asher Silver (UK). In July 2014, an American entrepreneur and traveler Patrick Sweeney attempted to break the record with his nine-year-old son P.J. and 11-year-old daughter Shannon. They were caught in avalanche, luckily escaped death and decided not to pursue their attempt. In August 2014, an unknown Austrian climber with his 5-year-old son were intercepted by mountain gendarmes at 3,200 metres and forced to turn around. On 5 August 2017, 9-year-old Hungarian twins and their mother were rescued from 3,800 metres by helicopter while their father and family friend continued their summit attempt. The summit of Mont Blanc is a thick, perennial ice-and-snow dome whose thickness varies. No exact and permanent summit elevation can therefore be determined, though accurate measurements have been made on specific dates. For a long time, its official elevation was 4,807 m (15,771 ft). In 2002, the IGN and expert surveyors, with the aid of GPS technology, measured it to be 4,807.40 m (15,772 ft 4 in). After the 2003 heatwave in Europe, a team of scientists re-measured the height on 6 and 7 September. The team was made up of the glaciologist Luc Moreau, two surveyors from the GPS Company, three people from the IGN, seven expert surveyors, four mountain guides from Chamonix and Saint-Gervais and four students from various institutes in France. This team noted that the elevation was 4,808.45 m (15,775.8 ft), and the peak was 75 cm (30 in) away from where it had been in 2002. After these results were published, more than 500 points were measured to assess the effects of climate change and the fluctuations in the height of the mountain at different points. Since then, the elevation of the mountain has been measured every two years. The interpretation that the heatwave had caused this fluctuation is disputed because the heatwave is known not to have significantly affected the glaciers above 4,000 m (13,000 ft). The height and position of the summit could have been moved by general glacial forces. At this elevation, the temperatures rarely rise above 0 °C (32 °F). During the summer of 2003, the temperature rose to 2 °C (36 °F), and even 3 °C (37 °F), but this would not have been enough for the ice to melt that amount. The summit was measured again in 2005, and the results were published on 16 December 2005. The height was found to be 4,808.75 m (15,776 ft 9 in), 30 cm (12 in) more than the previous recorded height. The rock summit was found to be at 4,792 m (15,722 ft), some 40 m (130 ft) west of the ice-covered summit. In 2007, the summit was measured at 4,807.9 m (15,774 ft) and in 2009 at 4,807.45 m (15,772 ft). In 2013, the summit was measured at 4,810.02 m (15,781 ft) and in 2015 at 4,808.73 m (15,777 ft). From the summit of Mont Blanc on a clear day, the Jura, the Vosges, the Black Forest and the Massif Central mountain ranges can be seen, as well as the principal summits of the Alps. The most popular route is the Voie Des Cristalliers, also known as the Voie Royale, Goûter route or modern normal route on the French side, which is the only way to the summit avoiding glaciers with their inherent dangerous crevasses. Starting from Saint-Gervais-les-Bains, the Tramway du Mont-Blanc (TMB) is taken to get to the fr:Gare du Nid d'Aigle. The ascent begins in the direction of the Refuge de Tête Rousse, crossing the infamous Grand Couloir or Goûter Corridor, considered dangerous because of frequent rock-falls, leading to the Goûter cabin for night shelter. The next day the route leads to the Dôme du Goûter, past the emergency Vallot cabin and L'arrête des Bosses. La Voie des 3 Monts is also known as La Traversée. Starting from Chamonix, the Téléphérique de l'Aiguille du Midi is taken towards the Col du Midi. The Cosmiques cabin is used to spend the night. The next day the ascent continues over Mont Blanc du Tacul and Mont Maudit. The historic itinerary via the Grands Mulets Hut, or old normal route on the French side, which is most frequently traversed in winter by ski, or in summer to descend to Chamonix. The normal Italian itinerary is also known as La route des Aiguilles Grises. After crossing the Miage Glacier, climbers spend the night at the Gonella refuge. The next day, one proceeds through the Col des Aiguilles Grises and the Dôme du Goûter, concluding at L'arête des Bosses (Bosses ridge). The Miage — Bionnassay — Mont Blanc crossing is usually done in three days, and has been described as a truly magical expedition of ice and snow arêtes at great altitude. :199 The route begins from Contamines-Montjoie, with the night spent in the Conscrits cabin. The following day, the Dômes de Miages is crossed and the night spent at the Durier cabin. The third day proceeds over l'Aiguille de Bionnassay and the Dôme du Goûter, finally reaching the summit of Mont Blanc via the Bosses ridge. Recent temperature rises and heatwaves, such as that of the summers of 2015 and 2018, have had significant impacts on many climbing routes across the Alps, including those on Mont Blanc. For example, in 2015, the Grand Mulets route, previously popular in the 20th century, was blocked by virtually impenetrable crevasse fields, and the Gouter Hut was closed by municipal decree for some days because of very high stonefall danger, with some stranded climbers evacuated by helicopter. "The First Ascent of Mont Blanc"
1786: The first ascent, by Michel-Gabriel Paccard and Jacques Balmat; see Exploration of the High Alps. 1787: The fourth ascent, by Englishman Mark Beaufoy, with at least six guides and a servant. July 1808 (1808-07): The first ascent by a woman, Maria Paradis, with Balmat as her guide. July 1838 (1838-07): The second ascent by a woman, Henriette d'Angeville. 1890: Giovenni Bonin, Luigi Grasselli and Fr. Achille Ratti (later Pope Pius XI) discovered the normal Italian route (West Face Direct) on descent. 1960: The airplane pilot Henri Giraud landed on the summit, which is only 30 m (98 ft) long. 1990: The Swiss Pierre-André Gobet, leaving from Chamonix, completed the ascent and descent in 5 hours, 10 minutes and 14 seconds. 30 May 2003 (2003-05-30): Stéphane Brosse and Pierre Gignoux tried to beat the record by ski-walking. They went up in 4 hours and 7 minutes, and came back down in 1 hour and 8 minutes. In total they did the ascent and descent in 5 hours and 15 minutes. 13 August 2003 (2003-08-13): Seven French paraglider pilots landed on the summit. They reached a peak altitude of 5,200 m (17,100 ft), thanks to the hot weather conditions, which provided strong hot air currents. Five had left from Planpraz, one from Rochebrune at Megève and the last one from Samoëns. 8 June 2007 (2007-06-08): Danish artist Marco Evaristti draped the peak of Mont Blanc with red fabric, along with a 20-foot (6.1 m) pole with a flag reading "Pink State". He had been arrested and detained earlier on 6 June for attempting to paint a pass leading up to the summit red. His aim was to raise awareness of environmental degradation. 13 September 2007 (2007-09-13): A group of 20 people set up a hot tub at the summit. 19 August 2012 (2012-08-19): Fifty paraglider pilots landed on the summit, beating the previous record of seven top landing pilots, set in 2003. This included the second ever tandem landing on the summit. 11 July 2013 – Kilian Jornet beat the fastest overall time for ascent and descent with 4 hours 57 minutes and 40 seconds. La Terre, son visage, is a documentary by Jean-Luc Prévost and published by Édition Société national de télévision française, released in 1984. It is part of the Haroun Tazieff raconte sa terre, vol. 1 series. In it he talks about the west-east crossing of Mont Blanc. The television-film Premier de cordée. La Roue (The Wheel, 1923) is a 273-minute film by Abel Gance depicting rail operations, workers, and families in southeastern France, including the Mont Blanc area. Mont Blanc is one of the most visited tourist destinations in the world, and for this reason, some view it as threatened. Pro-Mont Blanc (an international collective of associations for the protection of Mont Blanc) published in 2002 the book Le versant noir du mont Blanc (The black hillside of Mont Blanc), which exposes current and future problems in conserving the site. In 2007, Europe's two highest toilets (at a height of 4,260 metres, 13,976 feet) were taken by helicopter to the top of Mont Blanc. They are also serviced by helicopter. They will serve 30,000 skiers and hikers annually, helping to alleviate the discharge of urine and faeces that spreads down the mountain face with the spring thaw, and turns it into 'Mont Marron'. Global warming has begun to melt glaciers and cause avalanches on Mont Blanc, creating more dangerous climbing conditions. ^ Although Mount Elbrus is normally considered the tallest mountain in Europe, the latter continent is part of the Eurasian land mass, which culminates at Mount Everest (highest col between Mont Blanc and Mount Everest: 113 m ; highest col between Mount Elbrus and Mount Everest: 901 m ). 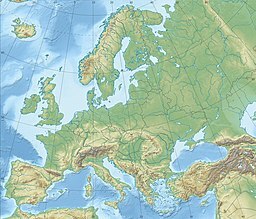 ^ The Caucasus watershed has conventionally been used as the boundary between Europe and Asia since the mid-19th century. The Caucasus has a number of peaks higher than Mont Blanc either marking the Russian-Georgian border or just within Russia (Mount Elbrus in the North Caucasus at 5641 m is the tallest in Europe when including the Caucasus). ^ a b c "Le Mont-Blanc passe de 4.810 mètres à 4.808,7 mètres". ^ a b "Mont Blanc shrinks by 45cm in two years". 6 November 2009. Retrieved 23 October 2017 – via The Sydney Morning Herald. ^ the prominence of 4,696 m for Mont Blanc is taken from the "Ultras Project" (peaklist.org), "List compiled 2004 by Petter Bjørstad, Jonathan de Ferranti, Eberhard Jurgalski, Vasja Kavcic and Aaron Maizlish". See also list of Alpine peaks by prominence. ^ Green, Stewart. "Facts About Mont Blanc — Highest Mountain in Western Europe". About.com. Retrieved 7 August 2011. ^ Muza, SR; Fulco, CS; Cymerman, A (2004). "Altitude Acclimatization Guide". US Army Research Inst. Of Environmental Medicine Thermal and Mountain Medicine Division Technical Report (USARIEM-TN–04-05). Retrieved 5 March 2009. ^ Cymerman, A; Rock, PB. "Medical Problems in High Mountain Environments. A Handbook for Medical Officers". USARIEM-TN94-2. US Army Research Inst. of Environmental Medicine Thermal and Mountain Medicine Division Technical Report. Retrieved 5 March 2009. ^ La disfida del Monte Bianco(in Italian). ^ "FICHE QUESTION". questions.assemblee-nationale.fr. Retrieved 23 October 2017. ^ "A new map of the dominions of the King of Sardinia. (with) Isle and kingdom of Sardinia. (with) Mont Blanc in Faucigni and the subjacent Alps and glaciers. From the original published at Turin with royal approbation, and dedicated to his Sardinian Majesty. By Francis de Caroly; translated with improvements and additions. London, Published by Laurie & Whittle, 53, Fleet Street, 12th May, 1799. Engrav'd by B. Baker, Islington. - David Rumsey Historical Map Collection". www.lunacommons.org. Retrieved 23 October 2017. ^ "Italia contro Francia la guerra del Monte Bianco". ^ "Italia-Francia, il duello dei confini sulla cima del Monte Bianco". ^ "1966: 117 die in Air India tragedy". 23 October 1966. Retrieved 23 October 2017 – via news.bbc.co.uk. ^ "Diplomatic bag contents revealed". 19 September 2012. Retrieved 23 October 2017 – via www.bbc.co.uk. ^ "Timeline of the Mont Blanc Tunnel". atmb.com. Archived from the original on 4 January 2014. Retrieved 23 October 2017. ^ "Mont Blanc Tunnel". www.tunneltalk.com. Retrieved 23 October 2017. ^ a b Lizzie Dearden (28 July 2014). "American climber whose children almost died in Mont Blanc avalanche says he has 'no regrets' amid criticism". The Independent. Archived from the original on 28 October 2015. Retrieved 9 September 2017. ^ Kim Willsher (2014-08-13). "Bodies of five climbers found on Mont Blanc after six go missing". The Guardian. Archived from the original on 2014-08-20. Retrieved 2017-09-09. ^ Boscoe, Charlie. "How to Climb Mont Blanc – The Two Easiest Routes". www.ukclimbing.com. Retrieved 9 November 2015. ^ Abjad (27 August 2008). "English: The Grand Couloir, Mont Blanc, France. Viewed from the Tête Rousse hut. Insert: approximate ascent route to the Goûter hut, with marking of the Grand Couloir crossing area". Retrieved 23 October 2017 – via Wikimedia Commons. ^ Gaventa, Jonathan. "The Ice and the Canary: A Story of Alpine Climbing in a Changing Climate". www.ukclimbing.com. Retrieved 9 November 2015. ^ Mont Blanc : une grande crevasse barre la voie royale du toit des Alpes! ^ "Henri GIRAUD". www.flight-system.com. Retrieved 23 October 2017. ^ "Extraordinary Speed Record on Mont Blanc". climbing.com. Retrieved 23 October 2017. ^ chamonix.net. "Mont-Blanc Speed Record: Ascent and Descent On Foot". www.chamonix.net. Retrieved 23 October 2017. ^ "Massif du Mont Blanc". UNESCO World Heritage Centre. Retrieved 10 January 2011. ^ Birch, Simon (2018-08-24). "Climate change is melting the French Alps, say mountaineers". The Guardian. ISSN 0261-3077. Retrieved 2019-03-20. ^ "Europe's highest toilet". Ananova. Archived from the original on 8 December 2008. Retrieved 20 August 2011. ^ "Warming threatens safety on Mont Blanc". The Times. London. 28 May 2013. 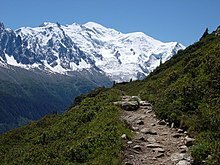 Wikimedia Commons has media related to Mont Blanc. Chisholm, Hugh, ed. (1911). "Blanc, Mont" . Encyclopædia Britannica (11th ed.). Cambridge University Press.